The calligraphy embossed on this old clay tea stand is written by a 16th century poet about teas in Fujian. A few weeks ago, a tea friend who came to the tea house was captivated by the clay tea stand that I use on my little horseback tea table. As I had another, identical stand, he decided to buy it as a birthday gift for a tea lover. To me the tea stand is a beautiful, handmade piece of clay, which has aged wonderfully after only 2 years. It is inscribed with intricate calligraphy, which was actually done before the clay was fired in such a way that the characters look like they were embossed on the tray. This tea friend was interested in knowing what the embossing was about. So I have translated the calligraphy and thought I would share it with you. The inscription is an extract from a poem by Zhou Lianggong (周亮工; 1612–1672). He was a misunderstood Chinese poet and magistrate, born in Kaifeng during the Qing Dynasty. 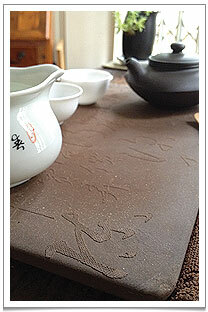 The 6th line of Zhou’s poem as inscribed on the old clay tea stand conveying the sentiments of Fujian tea masters. His poem ‘Min Cha Qu‘ [闽茶曲] has 10 lines about teas from Fujian known as ‘min cha‘ (‘min‘ [闽] refers to the Fujian region). 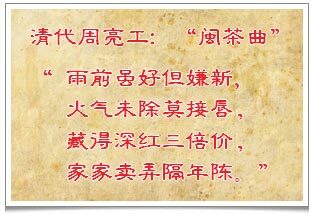 The poem is a lively description of changes in Fujian tea attitudes, production and appreciation since the Song Dynasty. The teas made and appreciated in Fujian back then were highly oxidised, dark roast oolongs, what we now think of as the more traditional types of oolong. The characters inscribed on the tea stand are taken from the 6th line of the poem and convey the sentiments of local tea masters towards certain teas produced in the early spring harvest (‘yu qian‘ [雨前], one of the 24 solar terms, around 19 February). Whilst they appreciate the tenderness of these tea leaves, the tea masters disapprove of their ‘newness’. The fire-smothering character (‘huo qi‘ [火气]) of these teas has not yet ‘settled’, so in their opinion they should not even touch the lips. On the other hand, if the leaves were left to vintage over four seasons, until they became a shade of dark maroon (‘sheng hong’ [深红]), their value would be three-fold. Every household in the region, as a matter of fact, is proud of its year-long aged tea (‘ge nian cheng‘ [隔年陈]). Now the subject of vintaging oolong teas (see our cantaloupe oolong and mandarine oolong) is an interesting one and I shall talk about it in a future blog post.